As for showy fall color, the Pawpaw isn’t glamorously breathtaking, but this time of year makes the yellowing of the leaves in mid-height understory an easy way to identify and stake-out Pawpaws in order to harvest their fruits the following summer. The Common Pawpaw (Asimina triloba) and Smallflower Pawpaw (Asimina parviflora, Annonaceae family) are small trees or shrubs found in the mid-height understory of undisturbed soil. Large, pointed-tip, oval leaves with fishbone-like veins grow in an alternating pattern on rusty brown stems. Smallflower Pawpaw has smaller flowers and fruits and is shorter than Common Pawpaw. Smallflower also grows in drier soil than Common Pawpaw. 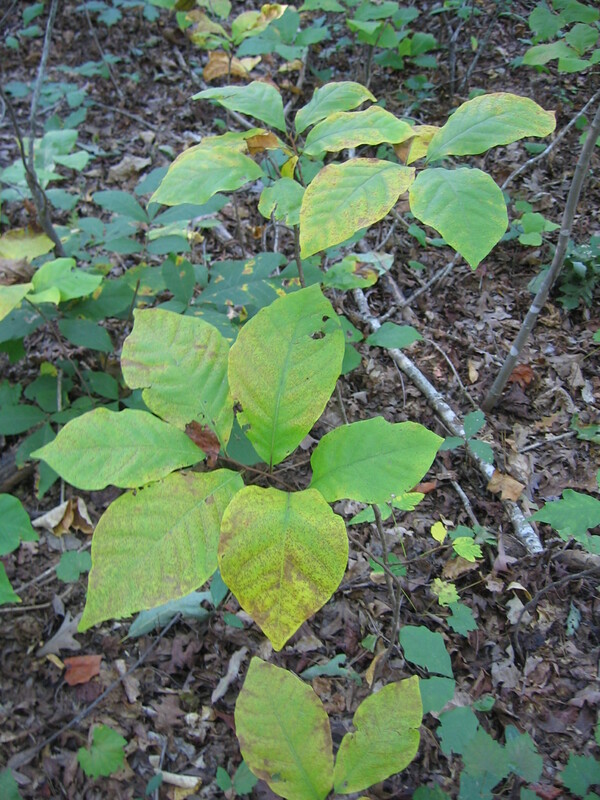 For more images of Smallflower Pawpaw visit http://www.duke.edu/~cwcook/trees/aspa.html. Cup-like, six-petaled flowers bloom in the spring. These inconspicuous, dark-burgundy beauties, are indicative of the unknown delicacy awaiting the forager-in-the-know come summer. In early North American history, the Pawpaw fruit was common and widely known. Nineteenth century medical botanists reported that African-Americans and Native Americans relished the custardy Pawpaw fruit for its taste, and also for its reported sedative and laxative effect. Ethnobotanical accounts of Native Americans document various nations preparing mashed, fresh Pawpaws into cakes and then drying them for storage. The dried fruit was taken on hunting expeditions as dried fruit leather, or was soaked in warm water to either prepare as a sauce or to add to a corn meal mixture. Pawpaws generally fall from the tree before they ripen. The forager gathers the fallen fruits, and ripens them outside because – at risk of losing some readers who were otherwise interested – I must disclaim, their smell is overpowering indoors. When the fruits turn from pale green to tamarind-brown, they’re ripe. The exterior is a fairly-tough peel, but the inside is soft and delicate like bananas. The fruit has attractive, dark, reddish seeds with hard, shiny seedcoats. Be careful to remove the large seeds before eating Pawpaws because they’re considered to be a vermifuge (kills vermin or parasites), which means they’re toxic by most accounts. Powdered seeds, for example, were applied to a child’s head for lice control. The destruction of habitat has drastically limited the quantity of Pawpaw fruit available. Local food and native plant enthusiasts are bringing back Pawpaw fruit through planting and providing the fruits at local markets. Pawpaws don’t tolerate the jostling required for grocery stores, so Pawpaw farmers must sell the fruits directly to customers as they ripen. Pawpaw twigs are a source of annonaceous acetogenins, which have been used as an alternative treatment for certain cancers. Recent laboratory research at Purdue University’s School of Pharmacy and Pharmaceutical Science found that extracts of Pawpaw are “among the most potent of the 3,500 species of higher plants screened for bioactive compounds,” and proven to be an effective antitumor compound, as well as a treatment for oral herpes, and a pesticidal shampoo for head lice, fleas and ticks, already known in folk medicine. Pawpaws make a case for protecting undisturbed forests as a source of economic and medicinal resources. The curious fruit also presents an argument for learning traditional medicine. This article was originally published in the Urban Forager Column of the Athens Banner-Herald, October 24, 2010.